In our daily lifestyle, we come across fire, scorching sun, chemicals, boiling water or other hot objects etc that may lead to accidental burns on our skin. In other words, burns have become an inevitable part of our lives, while some are quite severe making it necessary for us to rush to the nearest hospital; others are minor and can be treated with emergency first aid at home. Burns are not at all pleasing, not just for the long-term (at times permanent) marks they can leave behind but also for the intolerable pain that an individual goes through. At such a situation, if you have readily available ingredients in your home that can soothe the burnt skin, then I think that will be a huge relief for you. And today, I am going to talk about such emergency home remedies that will help you to treat minor skin burns easily at home. These home remedies are indeed safe, quick to make and easy to apply. Depending on their severity, burns can be divided into four different types. First-degree burns– These cause least damage and generally affect only the outermost skin layer. There is redness, swelling and slight peeling of skin (in some cases) in the affected area. Here we do not experience blisters. Second-degree burns– It goes beyond your outermost skin layer and leads to blisters. The blister has a wet appearance and can cause quite a pain. The more the severity of the blister, the longer will it take to heal. Third-degree burns– Here the intensity of the damage is more and the burn affects all the skin layers and takes a dark brown or waxy white appearance. Sometimes, it causes damage in the nerves and disables the individual’s ability to feel the pain. Third-degree burns can leads to severe scarring often permanent. Fourth-degree burns– This is the most severe form of burn and cause immense damage. It extends to the tendons, joints and bones and if goes out of hand, can turn life threatening. The third-degree burn and fourth-degree burn are the two severe forms of burns which should not be treated at home. In case of third or fourth degree burn, one should rush to the nearest hospital for immediate treatment. However, it is the first-degree burns and the second-degree burns that can be treated at home with the emergency home remedies we are discussing in this post. So are you ready? Let’s start. Accidental burns can happen any time and in order to treat minor burns, it is important that you have necessary ingredients in your home that you can use as an emergency first aid. Therefore, here are my top home remedies that can be used to treat minor skin burns at home. Treating your burnt area with cool water is the most important thing and the first thing you should do before applying anything on your burnt area. This will soothe your skin and remove the dirt and impurities from your skin as well. Besides, the cool water will lessen the impact of the injury and inhibit it from spreading fast. As you get a minor burn, immediately apply cool water on it. Continue for minimum 20 minutes before using any other ointment or remedy. Besides the various beauty benefits; studies confirm the efficiency of honey in treating minor burns. It is an antibiotic with a natural pH balance, which prevents the burn from getting infected. Moreover, honey is an anti-inflammatory agent that can cause considerable reduction in the swelling. The presence of the antioxidants in honey speeds up the healing process and gives you fast relief. Take around 2 teaspoon of organic honey and apply on the burnt area smoothly. You can do this daily at least three times to get quick relief. Aloe vera has been used since a long time to treat various skin problems with treating minor burns being one of them. The aloe gel is anti-inflammatory in nature and contains various antioxidants that heal the burn. The anti-microbial property of it does not let you get infection in the burnt area. Aloe vera also inhibits the formation of blisters and prevents scarring. Take aloe vera gel at around 1 teaspoon and apply on the burn portion of your skin. Repeat this daily 2-3 times to soothe your pain. You may buy aloe gel from the stores or extract the gel from the aloe leaves. This is one of my personally favored home remedy for minor burns on skin and I am sure it will be beneficial for you too. The mustard seeds contain allyl isothiocyanate, a counter-irritant compound that eases the pain of the burn and leads to better circulation of blood in the affected skin portion. Reports suggest its antimicrobial in nature that further prevents infection. Moreover, yellow mustard can fade your scar marks as well. To use this remedy, take adequate yellow mustard and water and make a smooth paste by mixing them. Slather it on the burn evenly. Use this remedy daily three times for better healing results. Nothing can get simpler than this and it definitely is the easiest home remedy for minor burns on skin. The mint toothpaste when applied on the burnt skin gives a cooling sensation that heals and soothes the pain of the burn. It is one of those techniques that offer instant relief. So try to keep white mint toothpaste at home that will serve your brushing purpose as well as work as an emergency first aid for accidental minor skin burns. For this to work, first wash the area with running cool water and then take the mint toothpaste and apply on the affected area. Keep it for around 15 minutes and then rinse off. Use this remedy to heal your wound. The tea bags that you use to make tea can actually help you treat a minor skin burn. According to studies, the tea bags contain tannins that are very beneficial in curing the burn pain. It does not allow the area to get infection and reduces the toxicity. It draws all the heat from the affected skin and helps to soothe the pain and the burning sensation. After you make tea, take around 2-3 used tea bags. Let them cool down and then put them on the burnt skin with the help of gauze. Keep for around 10-15 minutes and then remove. Use tea bags two times daily to draw the benefits of tannins on your burnt skin. According to studies coconut oil or “cocos nucifera” is an excellent remedy for treating minor burns. It has the ability to regenerate the skin cells and penetrate deep through the skin. It can soothe the burning sensation and prevent scarring and blistering owing to its anti-inflammatory, antiseptic properties and the presence of antioxidants in it. Take 2 teaspoons of virgin coconut oil and then apply it on your burnt skin using your fingertips. Let it stay and get naturally absorbed by your skin. Use it three times in a day for quick benefits. Milk is good for treating the minor burns. This is mainly due to the presence of zinc and protein in it that soothes the pain and heals the wound fast. It is also anti-inflammatory that prevents infection in the burnt area and reduces the swelling. Moreover, milk has the ability to lighten skin tone and so can fade away the marks even. To get the benefits you need to refrigerate the milk first and then apply on your burnt skin with a cotton ball. Let it stay for 15 minutes and then wash it. Repeat this technique several times in a day until your pain and the burning feeling reduce. There are various essential oils that are very efficient to treat minor burns. One by one, I will be discussing about the other effective essential oils as well, but let’s start with the lavender essential oil. The antiseptic lavender essential oil has many medicinal benefits with treating burns being a significant one. The linalyl acetate and beta-caryophyllene makes it an anti-inflammatory agent, which helps to prevent scarring, and speed up the healing process. Lavender oil is efficient in relieving you of the pain. At first, dab a cotton pad in undiluted lavender oil. Then apply evenly on the burnt skin. Let it stay. Repeat this 3 times on a regular basis to get fast results. Another essential oil that is great in treating minor burns is peppermint oil. The menthol in it soothes the burn with a cooling sensation and you get huge relief. Besides, peppermint essential oil is anti-inflammatory and analgesic in nature that is good for eradicating the pain and also in reducing the swelling. Drop few drops of peppermint oil in a cotton ball and then gently apply on the minor burn. This if you repeat 3-4 times daily will give you relief from the pain. One of the quickest home remedies for minor burns on skin is by using tea tree oil on it. The main reason why it is effective in case of burns is that, it is a powerful antiseptic and anti-inflammatory agent. It prevents infection and heals the wound faster. The pain lessens once you apply tea tree oil on your skin burn. You need to take few drops of tea tree oil and apply it on your burnt skin with a cotton pad. Use it twice daily to get the benefits. However, if you have a very sensitive skin you may avoid using this remedy or mix it with olive oil or coconut oil before using. Studies have shown frankincense oil to be an antiseptic having anti-inflammatory characteristics and so you may use it in case you face an accidental skin burn. This helps to protect the wound from getting infected as well stimulate the healing process. Apply adequate frankincense oil on the burn with a cotton ball. Use it twice on a daily basis to cure your burn. The delicious oats is not just good to taste but has many benefits with treating minor burns being one of them. It contains avenanthramides in it that is very efficient in reducing any kind of swelling or inflammation on skin. The other compounds like phytic acid and vitamin E also aid in the process of healing the burn and reducing the pain. All this antioxidants together makes oatmeal a soothing agent and hence you can use it in accidental minor burns. Here, at first, take 1 tablespoon of oats and let it steep in water for few minutes. After sometime, soak your burnt skin in this water. Continue for 10-15 minutes. Repeat this remedy two times daily. Vitamin E oil is widely used and has many benefits and now as per reports, you can use it on your burns as well. This is because the antioxidants in it can reduce inflammation and soothe your skin. Moreover, vitamin E oil leads to regeneration of your skin that facilitates fast healing of your wound. Take Vitamin E capsules and extract the oils. Apply it evenly on the burnt portion of your skin. Leave it to get naturally absorbed by your skin. Besides using the home remedies for minor burns on skin, there are few ingredients that are best avoided. So, here are my few tips that you must remember in case you face an accidental skin burn. The various oils like coconut oil, Vitamin E oil and all the essentials oils have been found to be effective in treating burns (as I have already mentioned above) and various studies are a proof of that but despite that, the efficiency of these oils in treating burns have been in controversy since a long time. There are counter studies and explanations opposing their potentiality. But you can definitely use these oils on your burns but since the severity of the burn or the skin type may vary, it is better to remove in case you find any discomfort after application. Same goes for the toothpaste as well. Despite getting widely used all over the world as an emergency first aid in case of minor burns, many consider its efficiency a myth. So if you are getting benefits and your skin is ok with it continue it else you may avoid it in case of any problems. Many people use butter on burns but I would personally prefer not to use it. This is because butter retains heat and may lead to bacterial infection in your burnt skin. 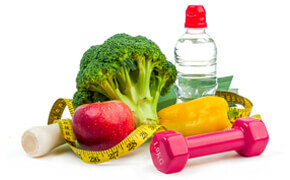 Therefore, it is better to avoid worsening your injury. Avoid egg whites as well. Eggs can have an allergic reaction on your burnt skin as well as increase the chances of bacterial infection on the affected skin. It is better to avoid ice as well as it may cause a cold burn and irritate your burnt portion. Do not go out in the sun as much as possible. The burnt area is sensitive, so direct exposure to sun may worsen the wound. Therefore, try to cover it with light clothing when you are out. I have seen many people popping blisters and let me tell you it’s dangerous. This activity of yours may infect the injury immensely. Over to you: which is your fav remedy to treat minor skin burns? We do not have any hold over accidents and it can happen anytime but what we can do is to keep some emergency first aids that we can use to get instant relief. This is same with accidental minor burns on skin as well. Burning is very painful and in case of severity needs immediate medical help. However, minor burns can be treated at home with simple ingredients like honey, milk, water etc. 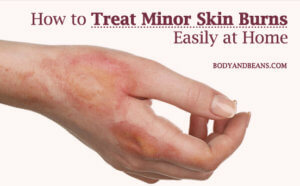 We have already discussed about 14 home remedies that can be used to treat minor skin burns in emergency at home. The common ingredients like honey, aloe vera, yellow mustard, oats, and various oils are very effective in treating minor sin burns. Although there are controversies regarding the usage of toothpaste and oils but I feel that if they are suiting your skin then there is no harm in using them. However, besides using these home remedies to treat minor skin burns, you must follow the other precautions mentioned above. These tips will help you in protecting the wound from worsening and comfort you with speedy recovery. Ever faced any minor burn on skin? How did you treat the burn? Feel free to share your emergency remedies to treat minor skin burns and I will be happy to add it to this list. Do like, comment and share this post with others.